An exploding star which has expelled the equivalent of between 160,000 and 230,000 Earth masses of fresh dust has been revealed by ESA’s infrared Herschel Space Observatory, suggesting that supernovae like this one, also known as SN1987A, could be the answer to an age-old puzzle of what supplied our early Universe with dust. This image compares two pictures of Supernova remnant called SN 1987A. 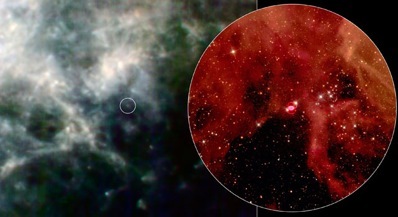 The left images was taken by the Herschel Space Observatory, whereas the right is an enlarged view of the circled region at the left, taken with NASA�s Hubble Space Telescope. Image: ESA/NASA-JPL/STScI. Astronomers focused on the remains of SN 1987A, the most recent stellar explosion to be witnessed with the naked eye from our home planet, for the study which is set to appear in the 8 July issue of the journal,Science. The stellar blast was believed to have occurred some 170,000 light-years away in 1987, where it was seen to brighten in the night sky before slowly fading over the months that followed. SN 1987A is one of the most extensively studied objects in the heavens due to astronomers being able to witness the star’s death throes over time. One such observation, which proved useful to the astronomers’ investigation, was a Herschel survey of the supernova’s host galaxy, the Large Magellanic Cloud, where SN 1987A was snapped. It is not just this current study that has turned up evidence that supernovae are capable of producing dust. NASA’s Spitzer Space Telescope, which detects shorter infrared wavelengths than Herschel, uncovered 10,000 Earth-masses worth of fresh dust around the supernova remnant, Cassiopeia A. 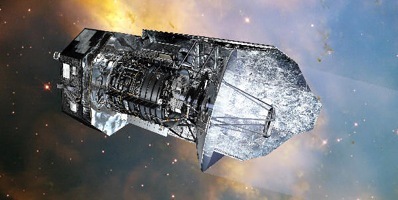 With Herschel, however, scientists can look into the coldest reservoirs of dust. “The discovery of up to 230,000 Earths worth of dust around SN 1987A is the best evidence yet that these monstrous blasts are indeed mighty dust makers,” says Eli Dwek, a co-author at NASA Goddard Space Flight Center in Greenbelt, Maryland.